A decade ago, UW-Green Bay launched a collaborative effort to bridge a perceived gap between the business world, the natural environment, and the role public policy plays in sustaining both. The University now has more than 100 graduates in the field with certification that helps them connect business and their environment and lead in both areas. The collaboration was formalized in 2008 and was named the Environmental Management and Business Institute (EMBI). Economics professor John Stoll ’73 (Regional Analysis) and Environmental Sciences professor Kevin Fermanich were named co-directors. Along with professor John Katers ’91 and ’93 (Business Administration, Environmental Science and Environmental Science and Policy), now dean of the College of Science, Engineering and Technology, recognized that each of these worlds had a significant influence on the sustainability of the other two, and that the symbiotic aspects of their relationships could be used for mutual benefit. As an article in the April 2009 Inside Magazine put it, EMBI marked “a renewed declaration to (UW-Green Bay’s mission) that ‘eco’ means both ecology AND economics.” John Arendt ’88 and ’12 (Business Administration and Environmental Science and Policy), the program’s current director, said Stoll, Fermanich and Katers realized the environmental focus that was at the heart of UW-Green Bay’s founding could be amplified through this multidisciplinary program. “It had been nearly 40 years since the first Earth Day had been celebrated,” said Arendt, “and we had learned a lot about how business and the environment depend on each other. EMBI was a natural extension of the University’s historical focus on the environment and public policy and integrated our on-campus expertise so we could connect to the community and make leaders and future leaders more aware of each other’s worlds.” That awareness effort is what drew Kaity (Gilles) Lindner ’11 (Environmental Policy and Planning and Public Administration) to the program soon after it started. 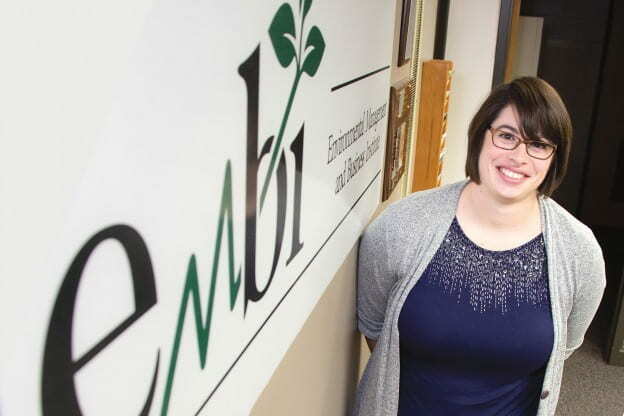 Lindner, a former environmental engineer at Green Bay Packaging, now works at Treehouse Foods in that role, and she credits her experience with EMBI for getting her there. “I came to Green Bay from my home in the Madison area for an orientation tour,” Lindner recalled. “I knew right away it was the right place for me, but, like most freshmen, I had no clear idea of what I wanted to study. I took an environmental science course and loved it. That led me to pursuing the Environmental Policy and Planning major and my introduction to EMBI’s Certificate in Sustainability. 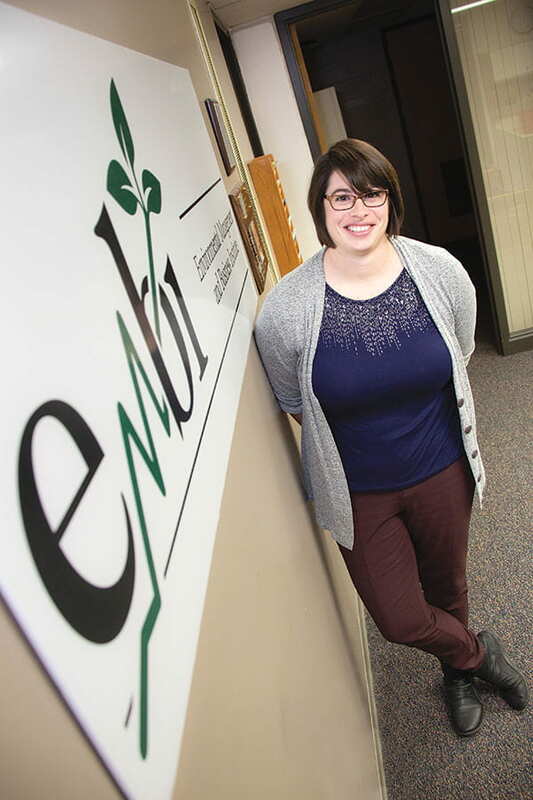 “The EMBI experience opened my eyes to what was possible for me,” said Lindner. “As part of the Certificate in Sustainability, I was set up as an intern with UW-Green Bay’s Sustainability Committee, which in turn, provided experience in collecting sustainability metrics, participating in meetings and initiatives.” This led her to a sustainability communications internship and eventually a full-time job at Green Bay Packaging (GBP). “The opportunities and people that were introduced to me because I was involved in EMBI led me to where I am today in my career.” Lindner continues to give back to the program and the community. She serves as chair of the selection committee for the Ethics in Business award program, which includes, among other criteria, social responsibility and ethical environmental behaviors. EMBI has evolved over the decade, but its mission has remained largely unchanged: Advance UW-Green Bay’s historic mission of studying environmental issues and developing multidisciplinary solutions to problems, where those solutions recognize the critical interconnections between science, policy and business, and the social contexts within which they occur.